Lucifer delivers a lot on its last stop before the season finale with lessons learned, characters redeemed and very moving storytelling. This is one of those episodes of a TV show that doesn’t seem to come around too often; one that begins seeming like a fairly casual episode and ends up punching the audience in the gut unexpectedly before the credits roll. Lucifer has often been one of those shows that is capable of pleasantly surprising me as a viewer but this is as near perfect as an episode of television can get by my estimations and it’s a testament to how much work has gone into making this show work from its fairly lacklustre beginnings. Funnily enough, going back to where the show began is one of the plot threads that the episode plays around with. Lucifer has been very consistent in his inability to understand how Chloe thinks despite his best efforts. The past few episodes have had him play around with another concept designed to help him figure out what makes her tick and apply that to their relationship. In prior episodes the success rate in terms of the narrative has been variable but the focus here is slightly different and it makes all the difference. Put simply, Lucifer puts all this effort in because he wants to fix the relationship he has with Chloe. Over the course of the season he has managed to identify that something about it is broken and he has taken it upon himself to repair that. Due to his lack of understanding of what the problem is because of a combination of his naivety and ego there’s no way he can approach it as any reasonable person would so he attempts to work through the process by focusing on various gimmicks. Last week he tried to get inside her head by imitating her behaviour and this week he tries to remove three years of complications brought on by their partnership by pressing the reset button. He doesn’t realise that it’s not as easy as declaring that a relationship is starting again with a back to basics approach nor is he aware of the effect his behaviour has on her; at least at first. This back to basics approach has some fun callbacks to earlier episodes such as when Lucifer tries to recreate the first time they met or revive the exact same monopoly game down to the exact rolls of the dice from “Chloe Does Lucifer“. These references work as fan service as many of the moments revisited are memorable on their own but they also take on a different hue when looked at through the eyes of experience and character development. The whole point of attempting to recreate them is to show how much has changed since they happened and highlight that relationships whether they be friendships or romantic are about moving forward. Lucifer isn’t equipped to learn that lesson as the episode begins but does so by the end. Part of this is down to Trixie’s reaction. She blankly tells Lucifer that playing the exact same game again isn’t fun which makes for an obvious yet poignant statement on the nature of life in general through the lens of a game of Monopoly. Trixie has no interests in playing a game that she has already played on a literal level and this helps Lucifer realise that Chloe doesn’t want to play the same games on a more symbolic level. When he tries to recreate their very touching dance from “High School Poppycock” it comes across as being so forced and insensitive that Lucifer is unable to ignore it and finally realises that his approach is not only futile but also directly harmful. 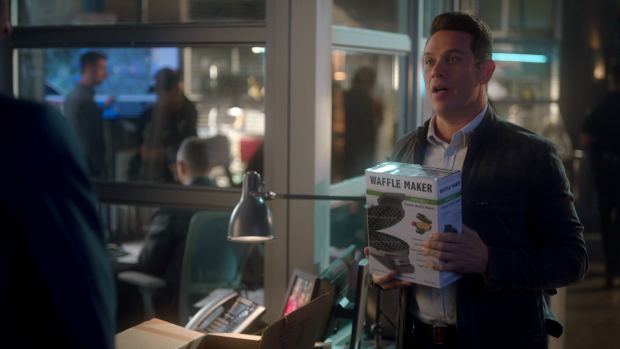 This pays off towards the end of the episode when he observes that Chloe doesn’t actually need his help to solve crimes leading him to conclude that she must have let him tag along because she enjoys working with him. Chloe’s case could have done more to illustrate that fact but it works well enough. Lucifer opens up to her about his main fears which involve her rejecting the real him. Despite everything he has been through he considers himself to be hiding a monstrous side that Chloe would be terrified of which leads him to confess to her once again that he’s the Devil. He naturally means this literally but Chloe takes it to be figurative and assures him that he isn’t. By that she means that she doesn’t see him as a monster and the pair finally admit their feelings for one another by way of a kiss that has been a long time coming. 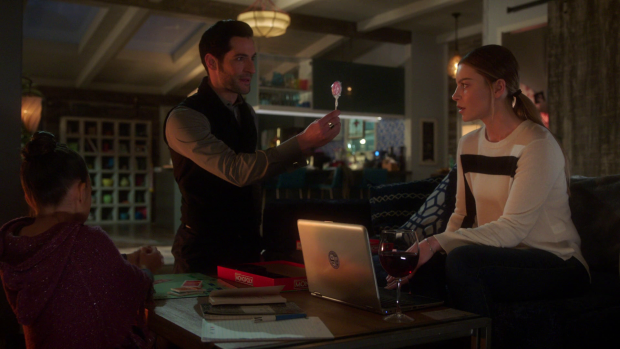 The truth of what Lucifer is still rests in the background unrevealed, or more accurately, unaccepted by Chloe but now they are finally on the same page as far as their feelings go. What the finale will do now that this is out in the open is anyone’s guess but the long road to this point culminates nicely in this episode. Still lurking in the background is Cain who is without his mark and wants it back now that he has lost Chloe. Any potential redemption for this character is completely cast aside -as I thought it should be- in favour of confirming that he’s a selfish and manipulative coward who has no respect or regard for anyone except from himself. His approach to planning is deliberately misguided as he makes sweeping statements about what the consequences will be without actually knowing what will happen. The way he attempts to manipulate Maze is both interesting and horrific as well as beginning her road towards redemption. Her arc has been problematic at times but she has been somewhat consistently self destructive in a way that shows how incapable she is of understanding how forgiveness actually works. Cain uses that to prey on her insecurities by dangling the promise of solving her problems by returning to Hell in front of her after she delivers Amenadiel to him so that Cain can kill him and frame Lucifer for the murder. The working theory is that killing God’s favourite son will restore the mark and allow Maze to return to Hell. In actuality he has no idea if any of this will work and seems content to just treat others like playthings until something does. This backfires when Maze goes to Amenadiel pretending to seek forgiveness after it dawns on her how much she has lost thanks to her self destructive nature. 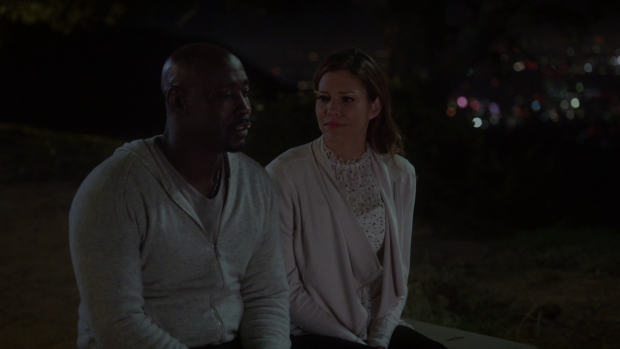 What she doesn’t expect is for Amenadiel to embrace her, forgive her for everything she has done and assure her that it’s never too late to turn things around and fix things. Amenadiel makes it clear that he will always be there for her with true sincerity in the delivery by D.B. Woodside. 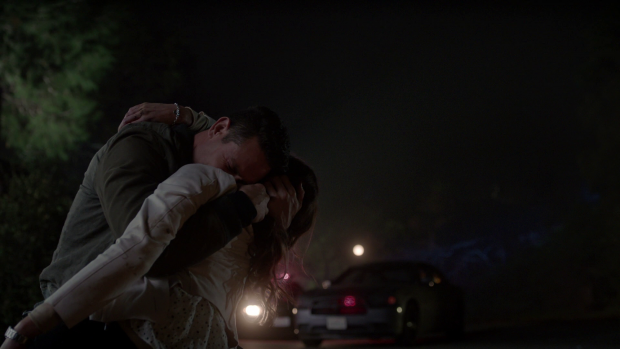 It’s a very tender moment and serves as a turning point for Maze who decides that Cain is a poisonous presence in her life and decides that it will be better if she kills him rather than listening to what he wants her to do. This results in a brief yet satisfying fight showing how committed Maze has become to making up for her mistakes in some way and ridding those she cares about of someone who is no good for them. Her potential for redemption is further highlighted by her reaction to Cain suggesting that he set up a fail safe involving putting Linda in danger. This gives us an important insight into Maze as a character and puts some of her behaviour this season into context. Up until this point she has never brought physical harm to anyone she cares about because that is a line she has decided not to cross. Even when Amenadiel and Linda betrayed her she couldn’t take it out on them physically even though she easily could. Her intent was to torture them and bring them deep emotional anguish on a par with what she was feeling but actually causing them harm was off the table. When Maze allied herself with Cain she was tasked with killing him and framing Lucifer for the murder therefore destroying his life on Earth and leaving him no alternative but to return to Hell. No physical harm was to come to anyone she cared about as Cain was an acceptable victim since he wanted to die and she felt that Lucifer deserved what was coming to him at that point. Threatening Amenadiel makes Maze aware of that line she would never cross and actively inspires her to repair that relationship through bringing harm to Cain for manipulating her as well as others that she cares about. It’s a powerful piece of character development for Maze and the passionate way she combats Cain shows that. Another character primed for redemption is Charlotte. Her arc has been all about avoiding Hell by getting into God’s good graces through good deeds. It has been frustrating for her because there seems to be little movement on her becoming a better person, at least in her own estimation but Amenadiel has served as something of a moral coach and compass for her. Early in the episode they toast the small victories that deserve to be celebrated such as managing to split up Chloe and Cain. Charlotte continues her quest towards becoming a better person by identifying wrongdoing and doing everything she can to prove that. Ultimately she succeeds thanks to determination and righteous belief that she is onto something as she looks for proof. It pays off and a murderer who abused women for years is put behind bars so that he can never hurt anyone again. Charlotte focuses on all the terrible things he did that can’t be erased but Amenadiel reminds him that her actions made a difference in the hear and now which definitely counts as something to be proud of. It’s a great episode for Charlotte who is definitely finding a better place for herself in the world. Her relationship with Dan is progressing in a really healthy direction, she is becoming friends with Chloe and her friendship with Amenadiel is something she clearly holds in high regard because he is such a positive influence on her and they clearly enjoy each other’s company. Despite the focus on how great Charlotte’s life was becoming for her I didn’t see her death coming. There was a strong focus her learning not to do good deeds simply for the personal reward that she receives. The work that she puts in to solve the murder is painful, bleak and dangerous for her personally with no real gratification. Her reaction to solving it is a morbid one because she focuses on what she failed to prevent rather than what she actually accomplished. It’s clear that she has evolved to the point that she doesn’t do the right thing for personal gain any more and this pays off in a big way when she dies. Cain means to kill Amenadiel but hits Charlotte when she leaps in front of him to take the bullets. It’s a completely selfless act out of a desire to help her friend at the expense of herself. Nothing about it is for personal gain and she dies for her trouble meaning that there’s no actual reward for doing good deeds. It’s symbolic of her entire arc and her sacrifice is the culmination of everything she realises which redeems her in the eyes of Amenadiel who recognises that she doesn’t belong in Hell so flies her up with his newly restored wings. It’s a really moving moment loaded with powerful emotional weight. Charlotte has made an impression on all of the characters in one way or another and the sombre final scene helps to reflect that. Dan’s reaction in particular is really effective by focusing on how devastated he is. The way he cradles her body as everyone looks on at him letting the grief and loss sink in works wonderfully and nicely marks the passing of a wonderfully complex character. Charlotte’s death comes after something of a personal realisation for Amenadiel who has been fixated on proving himself to his father through doing whatever he thinks will please him. This has caused him to have misguided notions about God testing him through putting Lucifer in his path vaguely hinting that his redemption has something to do with his brother. It has always been vague but both Lucifer and Amenadiel are both starting to consider the possibility that the machinations of God in their lives might be nothing but their imaginations. It is well established that going to Hell is tied to a sense of self worth in a given person and a feeling they have deep down about what they deserve so the next logical step is to apply that mindset to themselves. Amenadiel possibly lost his wings and other Angel abilities because he felt that he should lose them, Lucifer might have gotten his back because he felt divorced from what he used to be and was unknowingly embracing his better nature which meant that the Devil face disappeared. These aren’t answers but they are strong theories on the part of the brothers and it’s supported by Amenadiel’s wings being restored when he feels that they should be. He wants to keep Charlotte out of Hell and needs his wings to do that so his sense of self worth and commitment to his friend restores them in a brief moment. This revelation suggests that both Lucifer and Amenadiel are fully in control of their own destinies and can live their lives without worrying about what their father thinks or will do to them. A near perfect episode that contains a wide range of excellent characterisation moving everyone forward in their arcs in really effective ways. 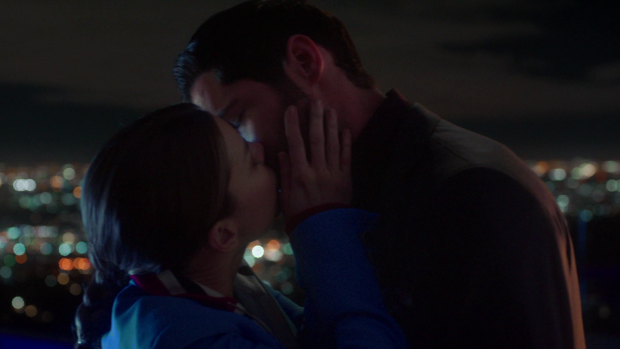 Lucifer’s failure to realise how Chloe thinks and that he actually wants to fix their relationship comes to a head in this episode as he thinks that stripping away the complexity of their relationship in favour of a reset button approach is what will repair it. Realising that he wants to fix it is a large part of what makes him able to do it as he finally understands that Chloe works with him because she likes working with him rather than actually needing him to help solve crimes. The episode could have done more with Chloe not needing Lucifer as a crime solving partner but what is featured is good enough. Having them share a long delayed kiss as their feelings are put out in the open makes for a great moment that feels well earned on both sides. Lucifer still sees himself as monstrous in a lot of ways but Chloe doesn’t see him that way and accepts him for who he really is even if she doesn’t know the entire truth. 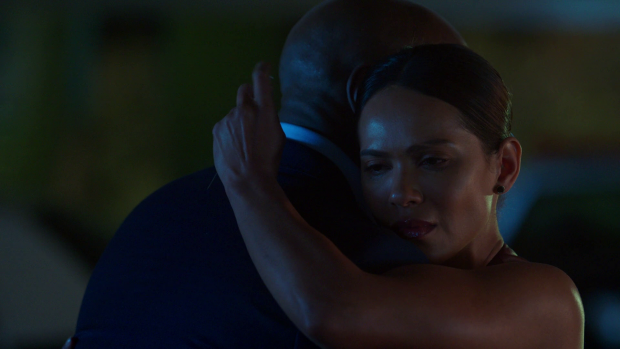 Maze’ deal with Cain being altered to make Amenadiel the victim is the start of a wake-up call for her partially brought on through Amenadiel’s unconditional forgiveness after everything she has done. It helps Maze realise what she is turning her back on and starts her down her own redemptive arc. Another part of it is down to Cain targeting the people she cares about and trying to make her aid in the murder of Amenadiel. She could have killed him and Linda before now but chose not to because she has a line she won’t cross. Cain on the other hand is a selfish and manipulative coward who only respects himself. The death of Charlotte makes for a really moving moment following important strides forward for her when it comes to becoming a better person. When she solves a murder she focuses on what happened in the past rather than feeling good about what she prevented and jumping in front of Cain’s bullets to protect Amenadiel was certainly a selfless act prompting the restoration of Amenadiel’s wings to keep her out of Hell. This comes after him considering the possibility that free will is the cause of him losing his wings and Angel abilities rather than some vague test from God.